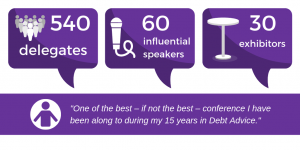 Bob’s Blog: Talk Money Conference 2018 roundup, dates for 2019! Welcome MALG members and contacts! Thank you for those of you who attended the Talk Money Conference 2018, it was a hugely successful event and we are delighted with the positive feedback from so many of you. For those of you who couldn’t attend, please find the links to the slides and keynote sessions below. The dairy for the rest of the year and across 2019 is already filling up and I hope to see as many of you as possible at the various events we have coming up in the MALG calendar. This year, MALG teamed up with the Money Advice Service to jointly present the Talk Money Conference 2018 on the 14th November to open it up to as many stakeholders from across the financial capability and debt landscape as possible with the joint aim of improving financial capability and the lives of people in debt across the UK. The content of this year’s conference was more varied than ever with five streams covering all the hottest topics in financial capability and debt advice. The joint reach of the two organisations enabled us to attract the best speakers and exhibitors, and a wider range of delegates/stakeholders than any other event in the sector. The event attracted over 540 delegates from across the whole of the financial capability, money/debt advice, credit, and wider sectors and had 60 influential speakers and 30 exhibitors at Westminster’s Central Hall. The event was hosted by Dharshini David; author, economist and broadcaster and there were 15 breakout sessions based on the 5 ‘rallying cries’ launched in the morning of the conference. Please find information here on the Calls to Action that were launched at the conference. For those of you who couldn’t make it on the day, the conference PowerPoint presentations can be accessed here. To help us evaluate the conference we would be grateful if you could answer the questions via the feedback link (if you weren’t able to complete these via the audience engagement platform on the day). Your feedback is very important to help us improve future events. Future National Meeting dates for the year ahead are:- 11th April, 4th July and 17th October. As mentioned in my previous blog, I’m delighted to share that we are launching a new MALG Region next year in the South West. The inaugural meeting will be hosted by Bournemouth Water (part of South West Water) on 24th January 2019 with further meetings set to be held in Exeter and Bristol. Over the years MALG has been indebted to the supportive sponsorship from a number of its generous members and supporters and this year has been no different. Thanks once again to Cabot Financial, Computershare, Indesser, Intrum, Lowell and UKAR for their support in sponsoring the MALG breakout sessions at the recent Talk Money Conference. We are looking at new and inventive ways to attract sponsorship in 2019 and these include the sponsorship of thre MALG Website and MALG events in the year ahead. If you have any specific ideas and initiatives or wish to discuss sponsorship options for the year ahead, please contact bob.winnington@malg.org.uk for further information.